As Fury Road opens, the titular Max has been reduced to the state of an animal, focused only on survival. Just as the world collapsed into chaos over the previous three Mad Max movies, so too has the character now completely devolved. For the first act of the film, even his agency is taken away from him as he becomes an unwilling blood donor and hood ornament until an act of god (in the form of a massive desert storm, the film’s only major CGI sequence) gives him a second chance. This leads to one of my favourite scenes in the film, in which Max comes across the women whose escape from sexual slavery has afforded him his freedom. His first view of them is hallucinatory—five scantily clad women washing the desert dust from their bodies. But the moment in which Miller seems to be pandering to the male audience’s taste for female flesh is also the moment in which he turns the scene on its head. Max’s attention is fixed on the water, not the women. The camera never lingers on any body part, except for the pregnancy-swollen abdomen of Rosie Huntingdon-Whitley’s Splendid Angharad. 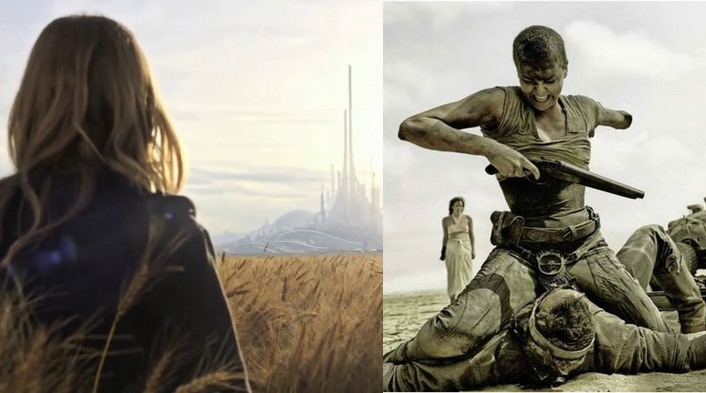 The women, together with Charlize Theron’s spectacular Imperator Furiosa, proceed to kick and bite to defend their chance of escape until Max gets hold of a gun and the rig and drives away. In the desert apocalypse, a truck full of water is beyond price. Women less so. That Max doesn’t leave them there is born both of necessity and the first of many decisions that lead Max to reclaiming his humanity. That’s his story arc, told against the backdrop of an epic running battle full of the kind of action that exemplifies the characters of all involved. But it’s far from the only arc—nearly everyone involved has desires and fears, and is running from something or towards something. That’s what makes the moments of loss and danger resonate. There are things at stake here, with everyone willing to fight for them. There’s been plenty said elsewhere about the feminism of the film, and it’s a deserved accolade. Furiosa is a match for Max, and the scene in which the two of them combine to fend off an assault on the truck shows their compatibility better than any romantic scene could. The other women too are literally fighting for the right to define their own lives rather than have them determined by men. But it’s interesting to look at Max, whose recovery from grunting animal (the first word he croaks, in the scene described above, is “water”) to a fully fledged human is capped by his ability to work with others, giving first hope and then blood to ensure Furiosa’s triumph. It’s an arc that gives two fingers to the notion of the lone hero—Max triumphs in a social context, not a solo one. This is all the more true given that this is a film in which the question asked is “Who killed the world?” The answer is the old white men who still cling on to their rule: Immortan Joe, the pustulent albino who who leverages control of water and food to maintain his rule is the main antagonist, but he’s abetted by two other of his ilk, the bloodthirsty Bullet Farmer and the rotting and obese People Eater. (As an aside, Fury Road has amazing character names. Check them out.) Amid monsters and grotesques, they’re the true villains because for them all others are fodder, not truly human. For all of the violence and madness then, Fury Road is an amazingly hopeful film. It’s next-to-impossible not to cheer for characters who are willing to fight to the last breath amid a hostile wasteland, and in their striving they make the deaths that some of them suffer meaningful. If nothing that is achieved too easily is properly valued, then Fury Road makes sure that its audience appreciates the ending that it gets. Which brings us to Tomorrowland, from a director I love, Brad Bird, and a writer I deeply mistrust, Damon Lindelof. Bird is a perfect choice for a film about wonder, family and hope, and Lindelof doesn’t seem like a bad choice for a film about big ideas—he’s a writer who’s not afraid of throwing deep thoughts at an audience. In fact, I’m happy to report that this is the work of Lindelof’s that I liked the best, but that’s a rather low bar to clear. The film’s opening prologue anchors the film clearly in a lost era of optimism about the future, specifically the “World’s Fair” era reflected in the eponymous area of Disney’s theme parks. Prologues, like flashbacks, are narrative shortcuts, sometimes necessary but a sign that the audience aren’t trusted to get the point themselves. Here, two characters are introduced, the boy inventor Frank Walker and the mysterious girl Athena who leads him to a world of jetpacks and rocketships. Fast forward to the present and, as in Nolan’s Interstellar, the dreams of a space-age future have been abandoned in favour of surviving in the here and now. Amid all this, the pointedly named Casey Newton, daughter of a NASA engineer, is trying her best to stave off the demolition of that future in a very literal way, by sabotaging the construction equipment set to tear down a space launch platform. It’s her devotion to the dreams of the future and her determination not to give up that earns her a glimpse of the lost future that Frank visited in person, and that glimpse sets her off on a journey that brings her into contact with an aged an cynical Frank and an unaged and still hopeful Athena. There are loads of nice touches put into play over the course of this journey, though there’s also a streak of glee in the occasional violence, including a cartoonish approach to the child characters’ physical robustness. These clever touches include the villains who lair in a comic shop that fetishises the future dreams that Tomorrowland represents, to Athena’s manipulative nature. This journey climaxes with a trans-dimensional flight to the promised land, but it also brings the film to a point where the film’s lack of depth begins to show through the cracks. The revelation of how Tomorrowland came to be is evidently meant to be a resonant moment, but it comes across as cramped and rushed (perhaps necessarily given that a chase sequence is ongoing) and it doesn’t get revisited. Less forgivable is the fact that the other-dimensional Tomorrowland proves so uninspiring once attained. The idea of the future abandoning us because we’ve abandoned it is an interesting one, but the half-finished/half-abandoned state of the putative utopia doesn’t exactly provide much reason for abandoning the planet it sprang from. The film’s biggest theme is the conflict between fatalism and optimism. It’s lampshaded by a philosophical question Frank asks Casey when they meet: “If you could know for certain the date of your death, would you want to know?” Casey’s response is to take the knowledge and deny the idea that fate is fixed, and her determination to find a solution is what sparks Frank back into life. However, the relationship of other characters to this drive is problematic. Athena is responsible for involving Casey in the first place, but she denies her agency several times. Governor Nix, played by Hugh Laurie, is fascinatingly revealed to have contributed to the encroaching but ill-defined apocalypse through his efforts to avoid it, but the film never really explores this twist, instead consigning him to the fate of being just another Disney villain. Few of his actions make any sense once the possibility of resolving his current impasse appears, and it undercuts the good work done in the first half of the film. Similarly, the resolution of the main problem amounts to throwing a bomb at it, which is a solution you’d expect to see in an action-heavy movie like Fury Road rather than an adventure like this. It’s great to see two such different movies tackling questions about the future, and I wish Tomorrowland had been as successful in doing so as Fury Road. The latter works in part because it foregrounds the characters and their journey over any points it’s seeking to make, allowing the viewers to dig in to the details and hidden depths as they choose. When Tomorrowland delivers its message, it’s a marker for the point when the characters start to take a back seat, and there’s just not as much to get your teeth into. We haven’t had the chance to see Fury Road yet, so I’ve skipped that part (though can I note, with horror, that only *one* all of the college-aged people I’ve heard discuss this film even know there were predecessors?!). But I have to say I loved Tomorrowland, and am sad that all of the press here is about “dismal” opening ticket sales, relative to Age of Ultron etc (which seems obvious: any Marvel movie will bring in giant opening weekends on name alone, regardless of the quality of said movie). Tomorrowland was light fare, but for me at least was a such a welcome return to an old romance with science, invention, the future… I miss that hope and promise in most movies/shows these days, and I hate that my engineering students talk about potential salaries instead of the potential to positively change the world. Ah! I am sentimental about this stuff, no surprise ever, but I’m rooting for this movie. Look forward to Fury Road too. We need more of this hopeful-joy stuff. I’m probably reviewing from a viewpoint of slight disappointment – I really wanted it to be good, my Lindelof mistrust aside. There’s a lot that’s good in there, and the message of aspiring and remaining optimistic is a great one (I loved the young actors’ performances as well), but I really wanted it to dig in to the themes it was playing with. The finale just didn’t really do that for me.